Background: The anti-plasmin activity of Tranexamic Acid (TA) is considered to be the main mechanism of hypopigmentation. Several studies have found TA to be effective for both oral and topical application. When used to lighten stains, TA is effective even at low concentrations, ideally in the range of 2 to 5%. Increasing the duration of treatment is more effective than increasing the concentration of TA: Higher concentrations of TA (> 5%) do not improve the effect but rather cause irritation. The TA formulations were applied once or twice a day, and the average duration was eight to twelve weeks: advantageous therapeutic effects were observed after this period. Other studies gave intradermal injections once weekly for 12 weeks, also with an acceptable efficiency. The compound may be administered topically to the skin in the form of emulsions, creams and solutions, and formulations containing liposomes. Encapsulation of TA in liposomes may reduce potential skin irritation, and it ensure high formulation stability, decrease the risk of leakage and allow long-term sustained release. Intradermal injections of TA produce relatively quick bleaching results without significant side effects. 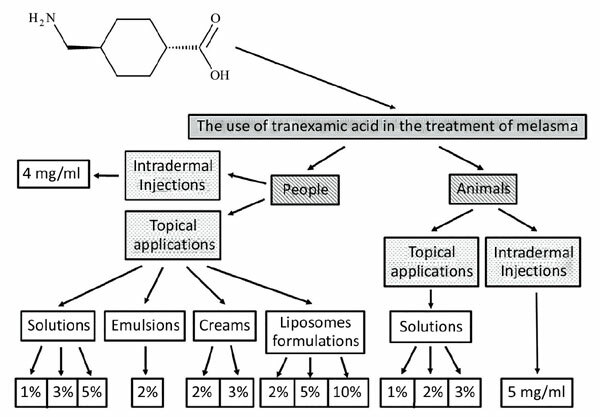 Conclusion: In conclusion it should be stated that the lightening effect of tranexamic acid in topical and intradermal applications has been most extensively studied in the case of melasma, and most studies have been performed in Asia. Therefore, the final evaluation of TA, in the cases other than melasma and hyperpigmentation, requires further studies. However, further studies are needed in order to optimize the frequency of application of TA and to determine the long-term benefits from its use, especially concerning stains other than chloasma. Keywords: Tranexamic acid, whitening, melasma, intradermal injections, microinjections, microneedling, topical formulations, liposomes. Keywords:Tranexamic acid, whitening, melasma, intradermal injections, microinjections, microneedling, topical formulations, liposomes. Abstract:Background: The anti-plasmin activity of Tranexamic Acid (TA) is considered to be the main mechanism of hypopigmentation. Several studies have found TA to be effective for both oral and topical application. When used to lighten stains, TA is effective even at low concentrations, ideally in the range of 2 to 5%. Increasing the duration of treatment is more effective than increasing the concentration of TA: Higher concentrations of TA (> 5%) do not improve the effect but rather cause irritation. The TA formulations were applied once or twice a day, and the average duration was eight to twelve weeks: advantageous therapeutic effects were observed after this period. Other studies gave intradermal injections once weekly for 12 weeks, also with an acceptable efficiency. The compound may be administered topically to the skin in the form of emulsions, creams and solutions, and formulations containing liposomes. Encapsulation of TA in liposomes may reduce potential skin irritation, and it ensure high formulation stability, decrease the risk of leakage and allow long-term sustained release. Intradermal injections of TA produce relatively quick bleaching results without significant side effects.